Windfall Theatre: FEARLESS SEASON 20! Windfall Theatre’s 2012-2013 Season celebrates the intrepid company’s 20th anniversary of bringing Fearless theatre to Milwaukee audiences staged in their intimate performance space located at Village Church Arts, 130 East Juneau Avenue, in the heart of Milwaukee’s downtown theater district. The three production season brings Milwaukee audiences a regional premiere, a world premiere and a legendary musical theatre masterpiece. The season opens on October 12, 2012 with the regional premiere of David Mamet’s timely pre-election comedy NOVEMBER. Written in 2007, Mamet’s hysterically satirical outrageous Oval office send-up revolves around fictional president Charles Smith days before his second election. With his poll numbers tanking, Smith is desperate and willing to do anything to turn things around including using the annual turkey pardoning ceremony as his last stand political power play. Christopher Elst, Beth Monhollen and Michael Weber. 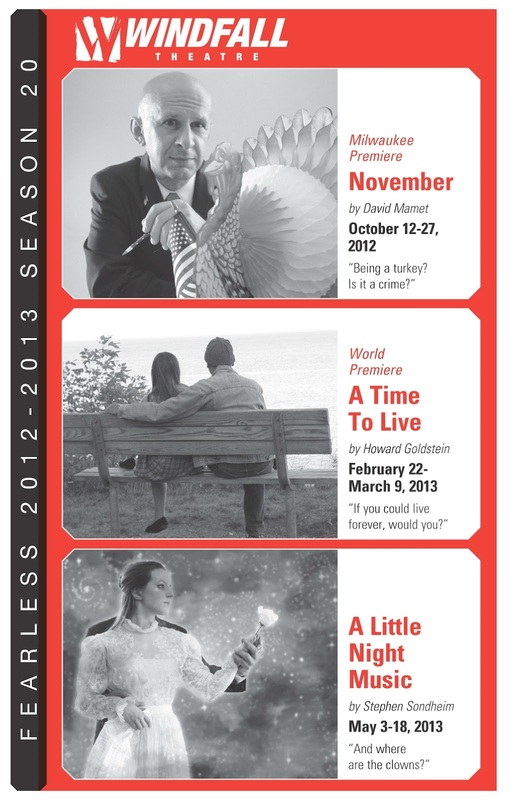 The season continues February 22 – March 9, 2013 with the world premiere of Milwaukee playwright Howard Goldstein’s poignant love story A TIME TO LIVE. Goldstein’s intimate play centers on Richard, an Eastern philosophy studies professor, and his wife Madeline whose decision to stop her cancer treatment sets Richard on a caregiver’s journey to keep them both in the present moment together in A TIME TO LIVE. Windfall’s season 20 finale celebrates the 40th anniversary of Stephen Sondheim’s legendary A LITTLE NIGHT MUSIC playing May 3-18, 2013. A Little Night Music is the gorgeous ¾ time witty waltzing musical masterpiece based on Ingmar Bergman’s classic film Smiles of a Summer Night. It is a breathtakingly haunting tale of past loves, missed opportunities, worlds changing and time wasted that touches the heart of our too hurried society today with its illusion of communicating yet rarely connecting and the regrets left in the wake of all those fading facades. Group, Senior, Student and Military discounts.